The Supreme Organising Committee is going full steam on the inaugural UAE Tour race date after a meeting at the Abu Dhabi Sports Council (ADSC) earlier this week. The UAE Tour was established after the merger of the Abu Dhabi Tour and the Dubai Tour following a Memorandum of Understanding signed by the Abu Dhabi Sports Council and the Dubai Sports Council. The 2019 UAE Tour, while retaining the UCI World Tour status, will be flagged off in Abu Dhabi and conclude in Dubai. 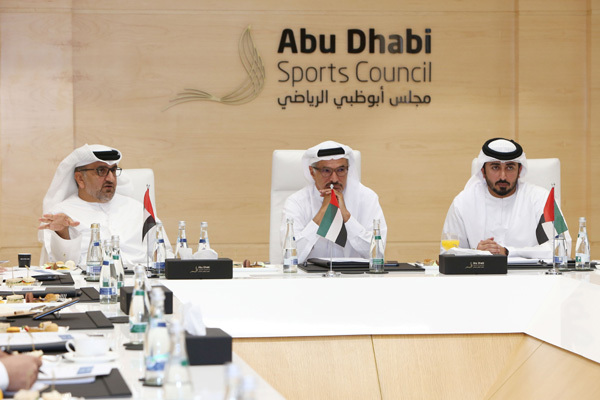 Saeed Hareb, secretary general of the Dubai Sports Council (DSC), chairman of the Supreme Organising Committee headed the meeting with Aref Hamad Al Awani, secretary general of ADSC and vice president of the Supreme Committee. The committee members present were Osama Al Safar, president of the UAE and Asian Cycling Federation; Nasser Aman Al Rahma, assistant secretary general of DSC; Mohammed Mihrab, Mohammed Al Shatri, Duchio Tikiyati and Anas Al-Fawair, and ADSC’s Saeed Al Muhairi, Mohammed Al Rumaithi, Munira Al Mahri and Nouf Ali. According to both Hareb and Al Awani, the UAE Tour will make a greater impact with the two Tour events combined and bringing together the experience of staging five Dubai Tour and four Abu Dhabi Tour events. The meeting reviewed the latest developments on the preparation for the UAE Tour, including the new routes, marketing campaigns, designing of a new logo, the role of sponsors and the cooperation with government agencies in all cities hosting the event. The meeting also discussed the plans of the marketing campaigns and the media for the UAE Tour with a press conference by the Supreme Organising Committee alongside the sponsors and unveiling the official logo in October. The meeting reviewed cooperation with ADP GHQ and Dubai Police at all levels, and praised them for their continuous support over the past years, which leads us to provide an exceptional version and experience in keeping with the status and name of the event. “The Supreme Organising Committee has now finalised the dates of the race and has put together all plans to portray both the country’s natural beauty of the desert, mountains and its modern cities, and iconic structures and places,” said Hareb. “In the coming months, we will unveil more details of the UAE Tour, including the logo, the race stages, the announcement of sponsors and the final stages of all the plans." “This first staging of the UAE Tour represents an important and new challenge to the Supreme Committee. It brings together the experience of the nine Tour races in Dubai and Abu Dhabi combined,” he said. Al Awani added: "The preparations are ongoing and the Supreme Committee is leaving no stones unturned." “We want to come up with unique new ideas and important decisions during the periodic meetings of the Supreme Organising Committee to achieve the best results to put up a dazzling and distinguished show of the UAE Tour to the global audience." The Supreme Committee discussed the educational programme accompanying the UAE Tour as in previously with both the Dubai and Abu Dhabi Tours. The previous events had drawn more than 4,000 students each year on educational programmes on the history of world cycling events. The UAE Tour will not be an exception. Osama Al Shafar, president of the UAE Cycling Federation, commented: “Both Sports councils have gained a great technical and organizational experience in recent years. The decision to join forces and create the UAE Tour guarantees a great future for professional and amateur cycling in the Emirates."